GET MORE ORGANIZED AND FREE UP WORKSPACEThere's nothing simpler than the concept of this compact knife holder?just attach it to a wall, and the strong magnet grips a wide range of knives in all shapes and sizes and easily find them within reach. Free up counter space and protect the knives' sharp edges from getting nicked and dulled when they are stowed in a drawer with other tools.DOUBLE MAGNETIC STRIPS FOR A SECURE HOLDWAREUM magnetic knife bar grips securely, yet easily releases your tools when you need them. It installs easily on a wall with screws and keep sharp or heavy objects out of children?s reach for safety. Its strong and heavy duty double magnetic strips hold the objects in place. Made from quality rustproof stainless steel, it is designed to last.Product Dimensions: 33.2 x 3.3 x 1.8cm; Material: Acrylonitrile Butadiene Styrene and Stainless Steel; Net Weight: 259gPROUD OF OUR COMMITMENT TO QUALITY AND SAFETYWAREUM is proud of its unwavering commitment towards providing superior and quality home kitchen products to our customers. We aim to offer our customers the best possible cooking and dining experience, by continuously introducing highly functional and reliable products for their cooking and dining needs. We strive to grow WAREUM into a brand synonymous with safe and high-performance products that meet and even exceed your expectations. In the event you are not satisfied, we provide a money-back guarantee for each WAREUM product sold. No questions asked! TOP GRADE STAINLESS STEEL STRIP ? WAREUM magnetic knife bar grips securely, yet easily releases your tools when you need them. The knife rack makes it easy for you to see and reach all your different knives when you cook. Magnetic knife racks preserve the edges on your knives since the knives do not scrape together in a drawer.ELEGANT, MODERN LOOK ? Its sleek and modern look adds a decorative touch to your kitchen. Displays your best knives in a line, and gives a clean, organized accent to your kitchen. Stowing knives in drawers may lead to accidental cuts and scrapes to hands while fumbling for a particular blade so this magnetic strip can keep everything within arm?s reach.EASY-TO-MOUNT WITH SCREWS INCLUDED ? A wall-mounted magnetic strip installs easily on a wall with screws. Tucked up and behind the sink, it is safe and inaccessible to children, but easy to reach for you. Made from rustproof stainless steel, the double magnetic strips ensure a secure hold.SATISFACTION GUARANTEED ? WAREUM is committed to providing superior and quality home kitchen products to our customers and we guarantee you will be satisfied. In the event you are not, we provide a money-back guarantee for each WAREUM product sold.DECLUTTER AND UTILISE MORE WORK SPACE ? ?Stick? your knives, utensils or crafty tools on this magnetic strip. Get organized and reach your tools easily. Can be used in the kitchen, office or garage. Its use is not limited to a knife holder. Scissors, whisks, screwdrivers, and almost anything metal can go on it too. Heavy duty magnets make your knives really cling. SIMPLE & ELEGANT MODERN DESIGN - Our HMmagnets 17'' magnetic knife holder is made from high quality stainless steel and designed with a sleek, elegant appearance. The flat, space-saving magnetic bar has a modern design that fits into *ANY KITCHEN STYLE*. The bar is designed to "float" on your wall, hiding the magnets & mounting screws. The design of our bar and the *SIMPLE, CLEAN INSTALATION* allows your knife and stainless steel appliance storage to become a part of your kitchen décor!. STORE YOUR KNIVES SAFELY & CLEANLY - Old style knife blocks are often *INFESTED WITH GERMS* from waterlogged or unclean wood and we all know there is no good way to clean those small spaces! Eliminate the problem with our magnetic knife strip. The magnetic knife holder allows each knife to stay clean edged, sharp, and dry, all while being securely stored *OUT OF REACH OF CHILDREN*. No more germs, no more cuts or pokes while pulling dulled, scratched knives out of cluttered drawers!. CLEAN YOUR KITCHEN COUNTER & DRAWERS! - HMmagnets magnetic knife strip helps you get rid of your old bulky knife block which takes up precious counter space. Our magnetic knife strip also helps you *KEEP YOUR KNIVES OFF THE COUNTER* and prevents the trouble of an overflowing drawer. All your knives will be visible and within reach - easily grab the proper knife and get to cooking! NOTE: The bar does not have back-sided magnetic pull force so it is not meant to be magnetized to a fridge.. EXTRA STRENGTH MAGNETS - We bring you a *NEW, UPGRADED* 17" stainless steel knife bar, now including *HEAVY-DUTY MAGNETS* which will never lose their magnetic force. This update provides you with a high quality magnetic knife holder that holds your entire knife set securely and in easy reach. Our chosen magnet has an even magnetic force across the bar allowing you to safely use the entire 17" length. The magnetic grip is very powerful, yet it only takes a gentle tug to release any knife for use!. SECURE ANY TYPE OF KNIVES - This magnetic knife strip is designed specifically to hold *ANY SET OF KNIVES* firmly, without slipping or shifting - not even a hint of a wobble! Our magnetic bar is calibrated to securely hold knives of many weights with ease. 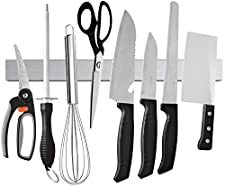 We are happy to provide worry free, safe storage for Chef's knives, Butcher knives, Cleavers, Bread knives, Carving knives and ANY other Kitchen knife you may have - from the largest, heaviest of your knives to the smallest and skinniest ones.. The Benefits of our New & Improved Professional Magnetic Knife Bar* Improved Length - Our magnetic knife bar is 17" long which is LONGER than a standard magnetic knife bar.An even magnetic force spans the entire bar, allowing you to safely use the entire 17" length and will keep your knife set secure and ready for use. Dimensions are 17 x 1.88 x 0.66 "* Upgraded Magnets - Avoid trying weak & unsecured magnetic knife holders! Our NEW magnetic knife holder now includes 3 separate lines of HEAVY-DUTY MAGNETS.We tested dozens of different knives to make 100% sure our customers will be satisfied. Our bar will safely hold the largest, heaviest of your knives to the smallest and skinniest ones, Chef's knives, Butcher knives, Cleavers, Bread knives and ANY other Kitchen knife you may have. * Improve your kitchen décor - With the simple and sleek design of our knife bar you can easily add an aesthetic and stylish look to your kitchen.The clean 17" of our high grade stainless steel on the wall goes perfectly with ANY KITCHENNotes: Pacemakers may be affected. Change pacemakers to test mode within 3 feet of magnetic bar The bar does not have back-sided magnetic pull force so it is not meant to be magnetized to a fridge ***OUR GUARANTEE*** Our magnetic knife bar is made to the highest standards, that's why we offer a 30 DAY MONEY BACK GUARANTEE!So what are you waiting for? Keep all your knives visible and within reach! Easily grab the proper knife and get to cooking!Plus it will make you look like a ninja chef! :) Just click on the 'Add to Cart' button and get yours today! Heavy Duty Knife Holder, Walnut Wood Magnetic Knife Bar, Knife Storage Strip 18"
ORGANIZE AND SAVE SPACE - Magnetic Knife Strip saves you counter and drawer space, providing you a convenient and easy to access place for all your knives, scissors, and other metal utensils..
VERSATILE AND CONVENIENT - Even though it is primarily used for knives, you can use your Magnetic Knife Holder as a magnetic utensil organizer to order your screw drivers, wrenches, drill bits and other tools in your tool shed or workshop. Avoid late night foot pain from stepping on your kids' toy cars and trains and line them up on this all-around organizational tool. Attach a fun metal charm to your keychain and easily hang your keys by the door with this handy home organizer..
SMART REPLACEMENT FOR KNIFE BLOCKS - Old-fashioned knife blocks can hide mold and germs, and are difficult to clean. Storing your knives on this magnetic knife holder saves you counter space and keeps your family from eating food cut by germy, dirty knives..
INCREASE SAFETY - Placing your knives out of reach of children will make your house a safer place for your kids. The strong neodymium magnetic rack ensures that the knives stay where they belong and won't fall like other knife bars, making sure your children don't get access to them.. LIFETIME WARRANTY - 100% Satisfaction Guaranteed and backed by our Lifetime Warranty..
Do you love meddling in the kitchen but want something to help you organize it? Are you sick and tired of trying to find the right knife or accessory in your top drawer? Are you afraid for your children's safety now that they're taller and able to open the said drawer? If on any of the questions you answered YES, then our wooden magnetic knife holder is what you need. There are many benefits for having your knives on a magnetic knife rack: - Your selection of knives are easily seen, NO PROBLEM IN GETTING THE RIGHT ONE. 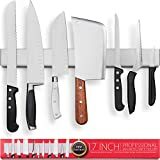 - Keep your knives organized, HANDY AND SHARP. Instead of having your knives banging and dulling each other in a drawer, they'll have their own spot on the rack. - STOP SCRAPING THE BLADE each time you slide a knife in or out of a knife block or drawer. 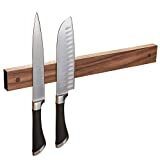 - This knife rack, with your knives will also add a distinctive, DECORATIVE TOUCH TO YOUR KITCHEN. Magnetic knife rack a beautiful and useful addition to your kitchen. Securely holds knives of all sizes, scissors, bottle openers and other metal kitchen utensils. Strong magnets are installed from the back which which allows the front to be solid wood. No screws or magnets visible. Finished with food safe board oil. Keyhole mounting brackets on the back make installation easy and secure. We offer an EXCLUSIVE LIFETIME WARRANTY. If you are not satisfied for any reason, just return the product for a full refund. So just click on the "ADD TO CART" button at the top of this page order your Magnetic Knife Holder today! wooDsom ORIGINAL STRONG hold. The most functional wooden magnetic holder available.. OPTIONAL SPACER adds 1/2" distance from wall (order B07PB4449L)..
ALL NATURAL WOOD, finished with food-safe oil. Space saver for the motor-home kitchen..
WON'T JIGGLE LOOSE. Solid, secure mounting from front face. Hardware and easy-installation instructions included.. CUSTOM LENGTH from 8"-36"! No dead zones..
Woodsom magnetic knife holders make a beautiful addition to any room where magnetic storage and organization are desired. Designed to accent décor as a secure wall-mounted organizer, or to fit in a drawer. 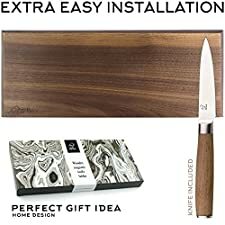 This magnet wood bar is magnetic to the very end, allowing for the storage of plenty of knives, kitchen tools, jewelry, or even tools in the workshop. The Woodsom holder is designed with solid mounting holes in the face to hold it securely to the wall or a cabinet. It even comes with a mounting kit for installation onto drywall or cabinetry. The mounting holes are beautifully finished with wooden plugs (supplied), adding a bit of charm to the face of the bar. This is a beautiful addition and a great space-saver for your motor-home. Niobium magnets are strong enough to hold knives and other kitchen tools while traveling. Another distinctive lifestyle product from Woodsom. Lightly coat with butcher block oil on occasion to keep your holder resilient. This is a great gift idea for the one who has everything. Ouddy top quality magnetic knife holder lets you hang your knives on the wall - saving valuable drawer space and providing more convenient access to your knives ! Simple solution to help rid the clutter of a bulky knife block..
Ouddy powerful magnetic strip is used to hold securely your knifes. Use this magnetic holder in the kitchen, office, laundry room or garage to hold any metal objects. And ensure young children won't have access to your sharp knives..
Ouddy magnetic knife tool bar is a convenient way to store knives, cutlery and other metallic kitchen utensils, including whisks, spatulas, stirring spoons and ladles. A great kitchen tool or Christmas gift/present for new homeowners !. Ouddy magnetic knife tool bar all hardware included for installation. Easy to easy to install, and the magnetic knife holder can mount onto kitchen walls with ease. 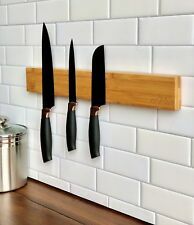 Your knives will stay in place and not slide off this magnetic knife rack.. Absolutely RISK FREE purchase! We are so confident in the quality of our product that you'll love it. If for any reason you are unsatisfied, simply contact us to return the product for a FULL Refund or Replacement. Your purchase will be backed by a 100% FULL MONEY-BACK GUARANTEE! Just click add to cart on this page to get yours NOW!.